Hate salad? Try our Mini Meatballs with Blue Cheese and Sweet Balsamic Onion Relish! Combine all the ingredients and fry in a frying pan with a little oil. Cook until the desired temperature, we like them well done and cook for 25 minutes. 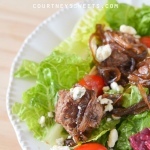 Serve with over salad with sweet balsamic onion Relish, blue cheese, and tomatoes.